This year, CES and its focus on the electronic and technology side of the industry continues to cast a shadow over the Detroit show. In fact, the competing presence of CES in early January played a big role in forcing the car companies’ home town to reschedule its marquee show. From 2020 on, the Detroit show will be held in the summer, rather than early in the year. Mercedes and Audi both presented concept vehicles that showed a far-off vision of where autonomous vehicles might take us. These were electric, self-driving transport pods so advanced in their notional capabilities that they didn’t have steering wheels. In fact, the Mercedes concept had seats that faced one another, rather than looking forward. Neither company demonstrated or even claimed to be close to delivering the autonomous technology necessary to make these mock-ups a reality. There was little or no discussion of what kind of processing power, LIDAR/radar technology, or V2X capability these vehicles would need to fulfill their promise. Indeed, neither concept had the kind of bulging sensor arrays that have characterized real self-driving prototypes, nor did either make any attempt to show how the batteries and motors needed for transport would be integrated into their ovoid forms. These cars existed more as ideas than as products, empty screens onto which everyone at the show could project their own vision of a driverless future. The stereo only plays Kraftwerk. The Audi drives itself, but you face forward and still don’t have to talk to your passengers. Other companies—not vehicle manufacturers, but suppliers—went in the opposite direction, using existing vehicle models jammed with sensors and computers to show off precisely what their hardware and software was capable of. These were pure technology test-beds, and the attributes of the car itself were largely beside the point. Perhaps nothing illustrates this better than the Autox booth, which used a bright green production Lincoln MKZ as a mounting platform for its prototype sensor technology. The MKZ, based on the decidedly pedestrian and soon-to-be-canceled Ford Fusion, has never been a poster-child of future tech, and apart from its association with Matthew McConaughey and a giant sunroof it has few “futuristic” elements. This, and the others like it, was a car purely serving as a mounting platform for the software inside. It may as well have been a wheel barrow. Lincoln's styling is a flat circle. 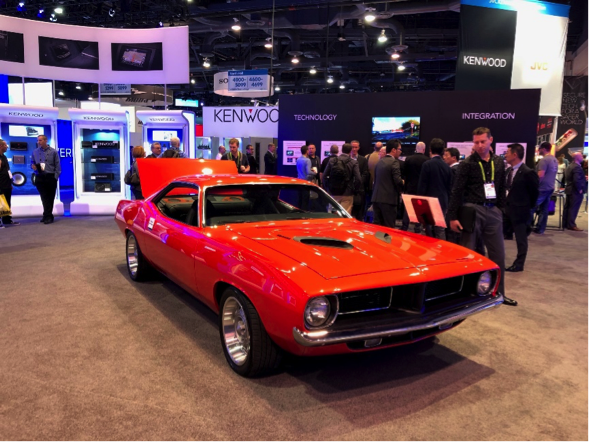 One of the most notable things at CES 2019 was the spray of cars being shown not as products themselves, but as signifiers for the coolness of the actual product on the floor. This was especially apparent from the number of classic and restomod vehicles, including a 1960s Volvo Amazon station wagon at the Thule stand, a 70s Barracuda and a 55 Chevy being used to sell speakers, and a classic Toyota Land Cruiser hawking car stereos. These weren’t cars as products—they were cars as nostalgic ideas, archetypes of classic style that immediately imparted cachet to the backpacks, ski racks, and in-vehicle electronics that surrounded them. The other Amazon at the show. ‘Cuda as a speaker platform. Other manufacturers side-stepped advances in consumer technology, autonomy, and so on by bringing their existing products and showing them off the way they would at any typical car show. Like Detroit 2018, the main focus here was on the power, performance, and capability of the cars as cars, not on groundbreaking technology. BMW took the lead on this front, with actual test drives of current models and an “off road” course that allowed its new, flagship luxury SUV (the X7) to clamber around a carefully designed obstacle course, which was (in a bit of on-the-nose naming) called the “Urban Jungle.” The display space looked a little farther into the future with a prototype of the company’s next EV, the iNext, but this too is precisely the kind of concept one would expect to see at a normal car show. Similarly, Audi showed its new eTron SUV in a couple of contexts, including in the Amazon Alexa booth, but apart from electric power and seamless digital assistant integration, the eTron was presented the same way the X7 and iNext were—as something instantly recognizable and useful in a very traditional way, despite the technology inside. Hey Alexa, what does an Audi e-tron look like? The BMW iNEXT’s giant grille will make production; the blue fuzzy interior probably won’t. Las Vegas, the home of CES, shares the dubious distinction with Detroit of being a city built without any apparent regard for walking or effective mass transit. As with Detroit, the “mass transit” options in Las Vegas are either amusement-park style trains that don’t go where they need to go…or buses. The result, when 180,000 people descend on the city for CES, is that cars and taxis plug the streets like plaque in arteries. The one-mile trip from the north part of the strip to the Convention Center can take an hour, as ride-share cars and personal automobiles vie for space with buses and taxis. This, in a nutshell, is an unwelcome vision of automotive dystopia; a future where everyone has access to a car, but no one has access to effective transportation. It’s this last future that the car companies are doing their best to avoid. Ford’s reinvention of itself as a mobility company, and its showcasing of electric scooters and other “layered” transportation options, showed one way in which car companies hope to move forward. And autonomy holds another key to reducing congestion, allowing fewer cars to carry more people—though if anything CES 2019 suggests autonomy is still a way off. But perhaps the biggest lesson from CES 2019 is that while cars can play any number of roles at the show, their presence in a “consumer electronics” show remains as guest stars, not headliners. Maybe there still is a role for the auto show, after all. See you in Detroit in June of 2020. Josh, co-chair of the Unmanned Aircraft Systems (UAS) practice, represents clients in proceedings before the Federal Communications Commission (FCC), Federal Aviation Administration (FAA), and other federal agencies, as well as in federal and state court actions. In addition to regularly advocating in front of federal agencies, Josh argues in federal appellate court as well as in federal district court and state court.